-- Select a Size -- 6"-10" 10"-16" 14"-20" 18"-26" - Out of Stock! 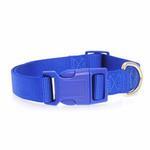 Add some color to your dog's day with the Zack & Zoey Nylon Dog Collar in Nautical Blue! Our Zack & Zoey Nylon Dog Collar in Nautical Blue is a durable and fashionable basic but this collar is anything but boring! This classic blue collar won't detract from your dog's natural good looks and matches all of our other nautical blue items in our store. Nylon Dog Collar by Zack & Zoey - Nautical Blue Customer Photos - Send us your photo! My favorite color out of all of them. Will buy again. Posted On 08/15/15 by Wailynn J from Kapaa, HI Yes, Wailynn J recommends this product! Exactly what I was looking for. Easy on, easy off. Adjustable strap makes it perfect for my pet. Awesome color selection. Nice sturdy collar in bright colors. Great clasp. Posted On 12/14/14 by Danielle C from Albuquerque , NM Yes, Danielle C recommends this product! Fit my female chiweenie great. She is 14lbs and the XS was very thin and looked kind of funny on her. So I ordered a small and it looked great. Posted On 10/29/14 by Kathryn E from NT, NY Yes, Kathryn E recommends this product! these are the best. I get a new one every few months just to change up the color and because they're so reasonably priced! Great collar in a great color, well made! 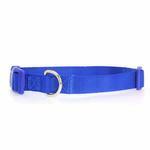 This blue dog collar was given to a local pug rescue, and it is being well used! This collar is well made and sturdy--it will last a long, long time. The color is nice and vibrant, just what any dog wants!